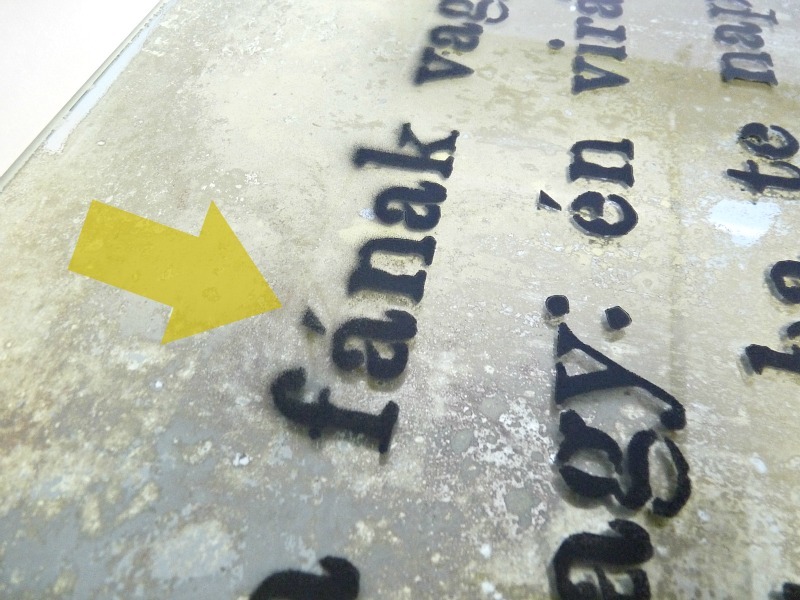 Yesterday I shared my tutorial for how to “antique” a mirror with muriatic acid. 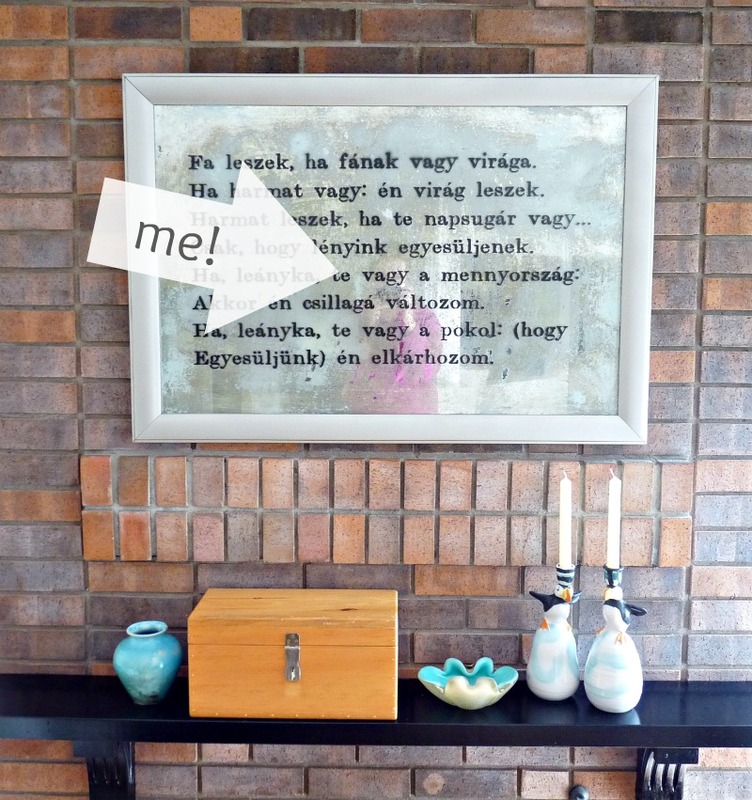 Now I can show you the rest of the project: how I turned an old bathroom mirror into a unique work of art! 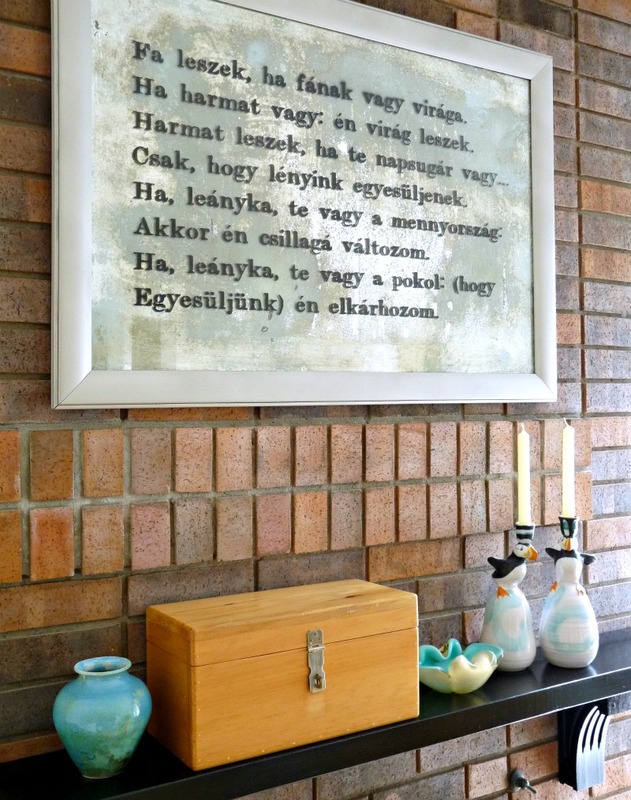 After antiquing it, I stenciled a famous Hungarian poem onto the mirror and then Hubby & I built a simple, inexpensive frame. 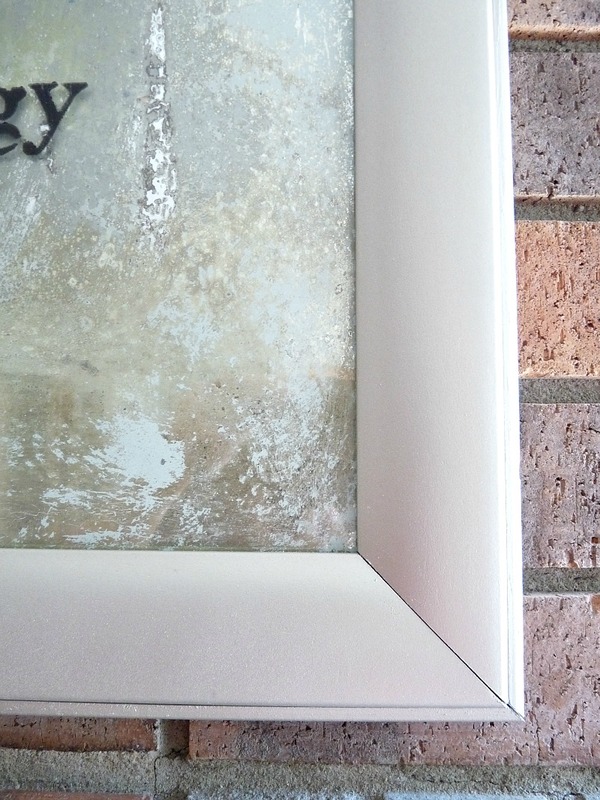 Here’s a sneak peek at the finished product, but keep reading for tutorials on how to stencil a mirror and how to frame a mirror – plus tons more photos! After antiquing the mirror, I laid it back down on my work surface, reflective side up, and positioned the stencil I ordered from Stencils Online (I collaborated with them for my my feminist DIY mirror as well). 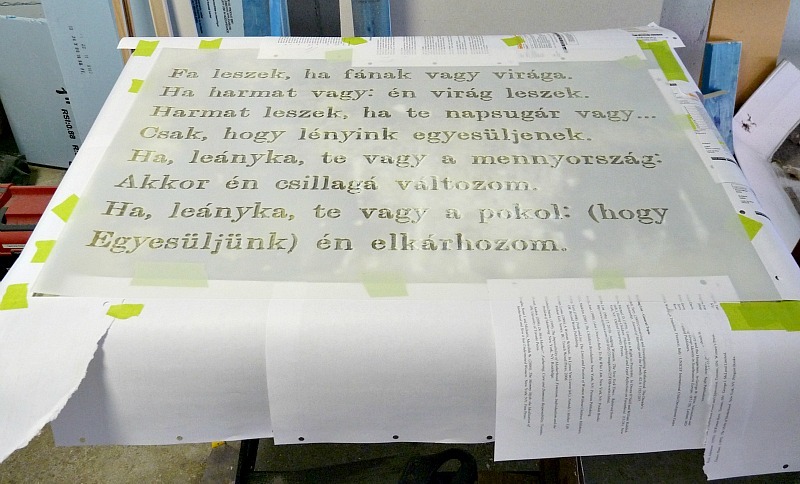 For this project, I used a famous Hungarian poem by Sándor Petőfi (the translation is at the end of this post). The poem is beautiful and the proportion was perfect for the mirror (this is exactly how I found the poem written). I sent the poem to Stencils Online and asked for “typewriter-ish fonts”. After looking at a few different proofs, I chose this font, and it’s perfect. To make sure it didn’t end up wonky, I measured and marked with masking tape where the stencil should go. Then I covered the edges of the mirror with scrap paper to protect from over spray. 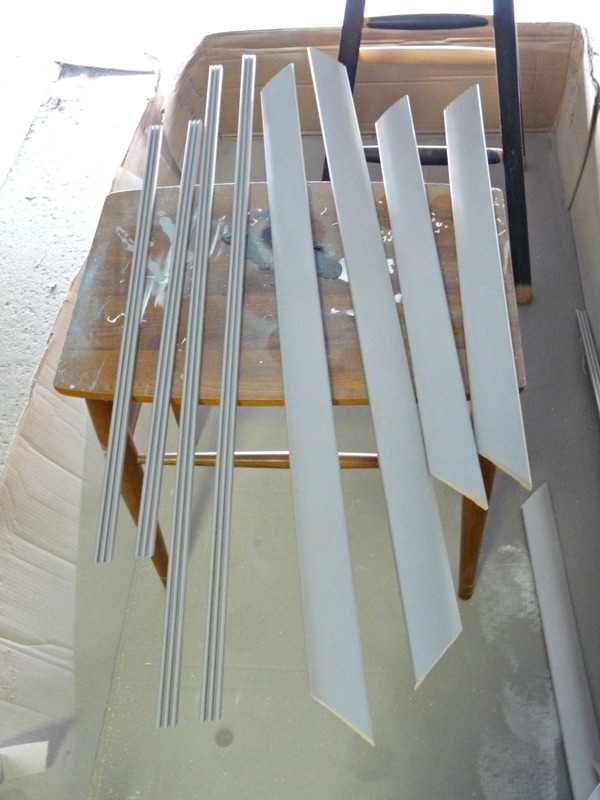 When I was all set, I misted the back of the stencil with spray adhesive and laid it down on the mirror. Using Krylon Brushed Metallic Satin Oil Rubbed Bronze spray paint, I misted the stencil in multiple, thin coats, working quickly. 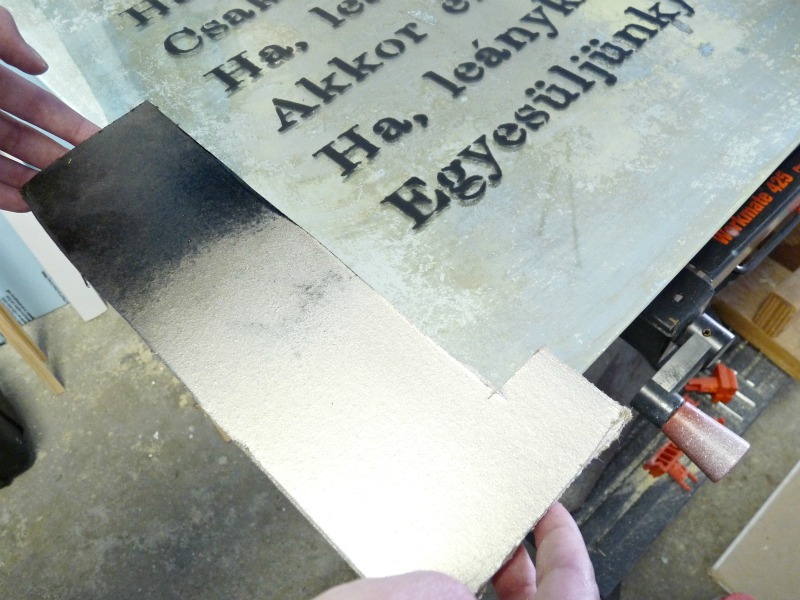 When the letters looked opaque enough, I quickly removed the stencil and allowed the paint to cure fully. I had one little “oops” moment: a tiny area didn’t get enough spray adhesive so the paint blurred a little bit. Luckily, it is hardly noticeable. 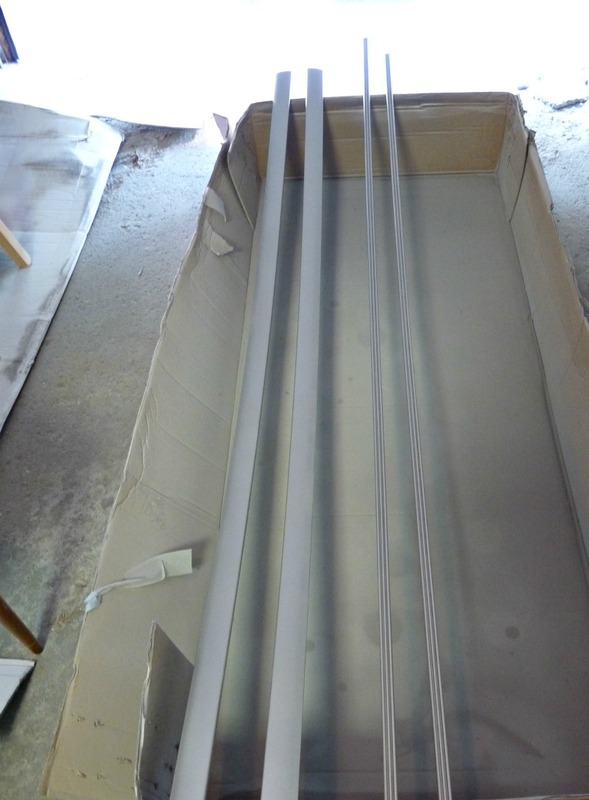 First, I decided what colour I wanted to paint the frame, because I did that early in the process. I considered black, but in the end liked the Satin Nickel I used for the back of the mirror, during the “antiquing” process. I sprayed a scrap and held it up to the mirror to help decide. We bought casing and screen mould (for the edge) at Lowe’s, but any home improvement store will have some trim that will work. Right away I painted them silver. Then Hubs made the cuts and I touched up the edges with the silver spray paint. We cut a sheet of plywood that was slightly bigger than the mirror – the casing overhangs the mirror but reaches the edge of the plywood. The measurement will vary for the size of your mirror/trim. 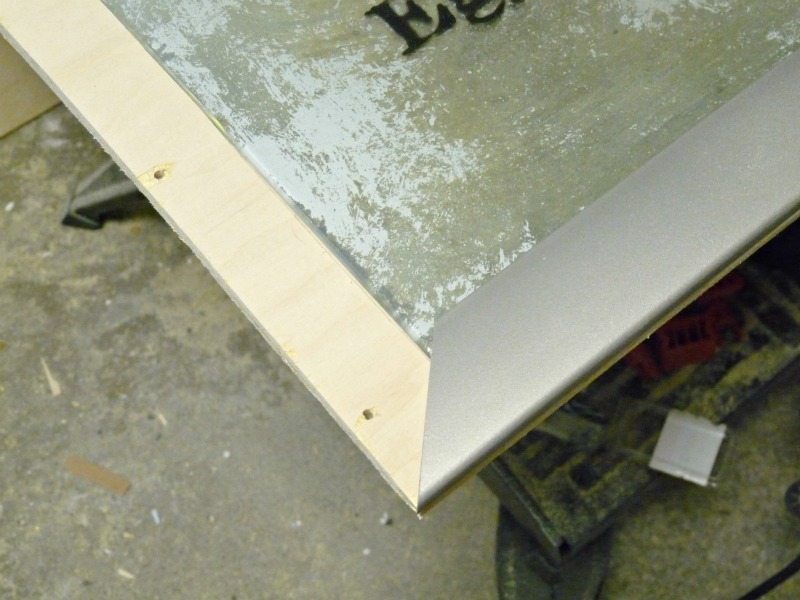 We left an extra little bit so the edge could be belt sanded (or hand sanded) after it was cut, for extra neatness. At the same time, we glued down the mirror, using Lepage PL Premium Construction Adhesive. We asked the expert at our local improvement store what would be best for gluing a mirror to plywood and this was what he recommended. 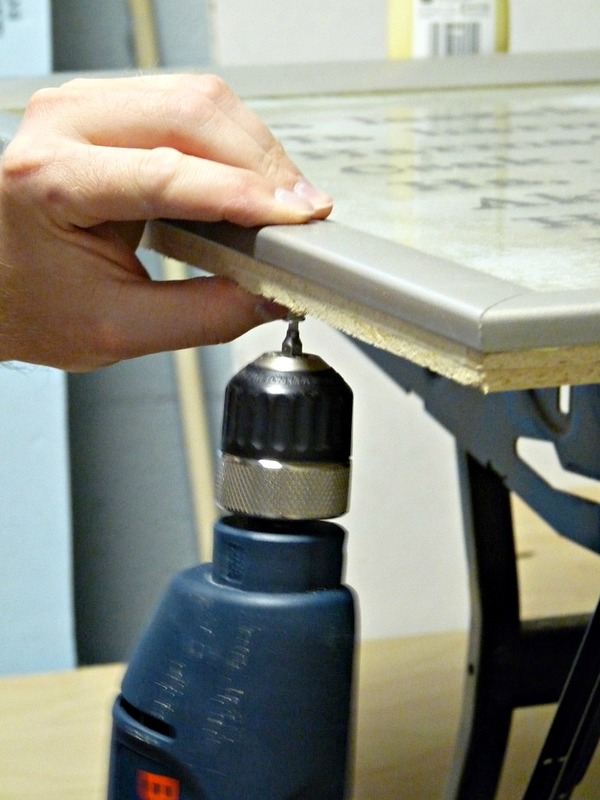 Hubby then pre-drilled holes through the two layers of plywood and glued the casing in place with adhesive. 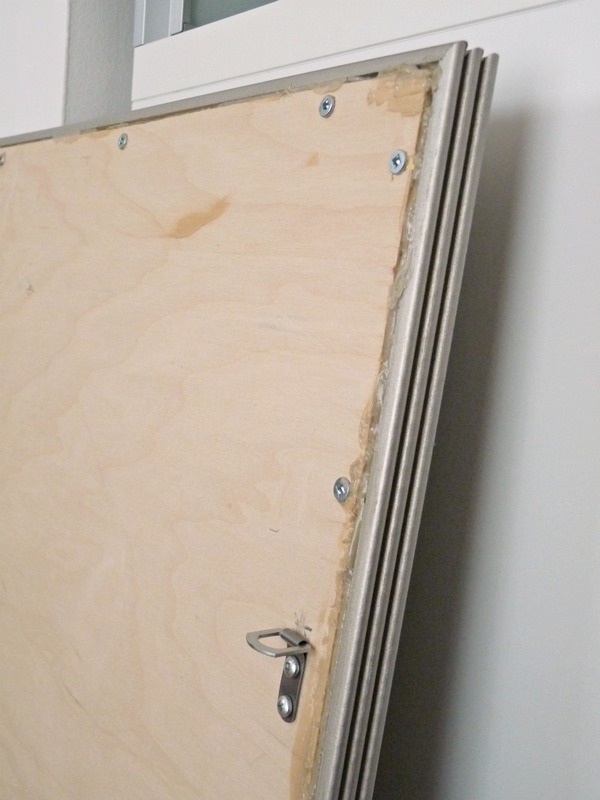 To add a touch more security (although the frame is in NO way load bearing – the mirror relies on the glue for hold), Hubby screwed the casing (frame) to the layers of plywood, from the back. 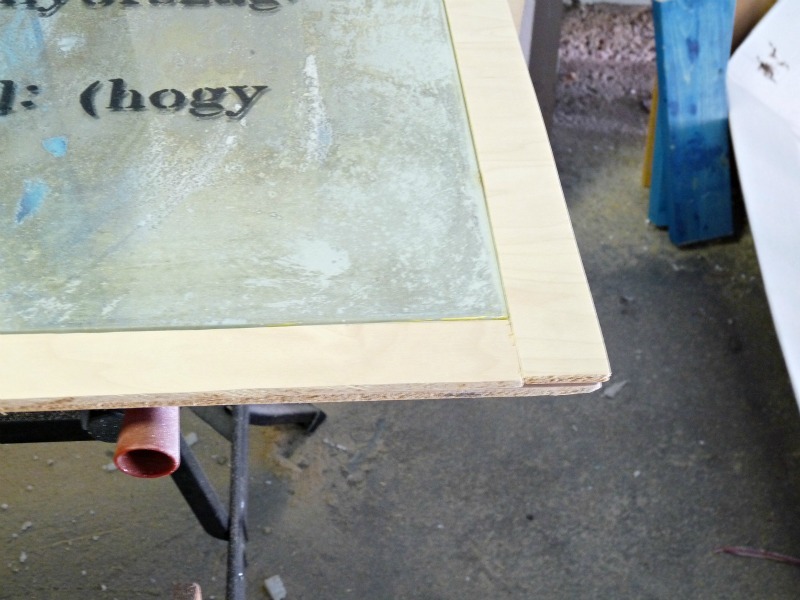 Then, using consutruction adhesive, we glued on the screen mould to hide the rough edge. Home improvement stores have a ton of selection and there were some really stunning trim pieces but I chose this simple profile. It hides the edges and adds a touch of visual interest from the side. The back is a wee bit messy, but we scraped off excess adhesive that has squished out and added two hinge hangers to use with 30 lb. braided picture hanging wire. 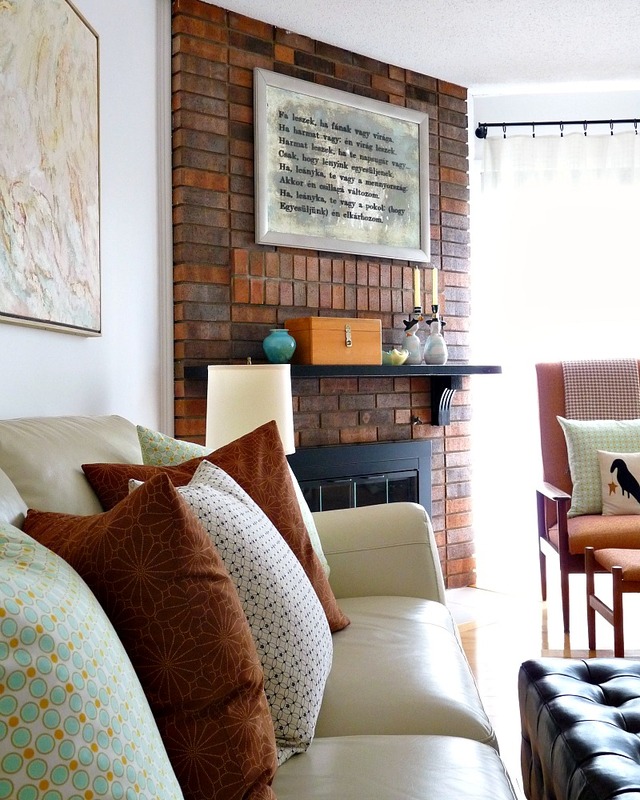 Here are some tips for drilling into brick and also hanging the mirror. I definitely think that this new stenciled mirror is a better scale than the print I had there and with new, cheery turquoise accessories, the fireplace looks better. A subtle change, and there will likely be more, but after everyone’s advice on my post asking for fireplace feedback, a mirror seemed like the popular decision. I just decided to give it my own spin! One reason I chose to antique the mirror is that this is the view opposite, and I didn’t really think it warranted a reflection. But the antiqued mirror still reflects light and sparkles on sunny days, so it’s a happy compromise. What a lovely poem! For a while there while I was reading the post I thought you weren't going to give a translation! What a nice poem! And you're living room is so nice! 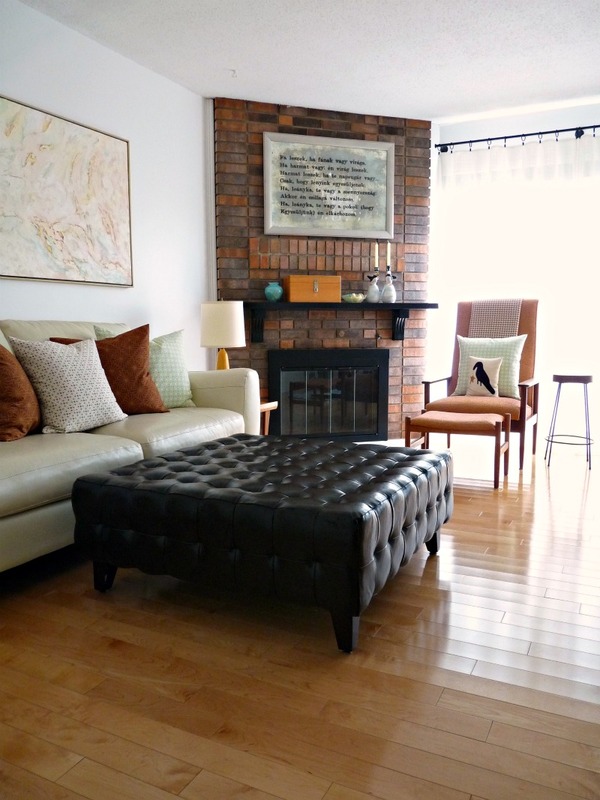 I love that giant ottoman! 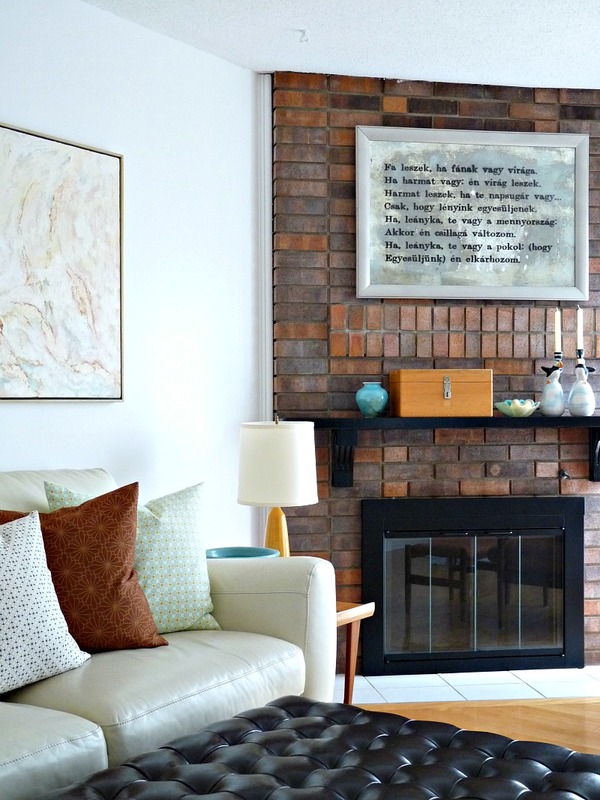 Happy to hear the fireplace looks better – I've been struggling with it, after my decision not to paint the brick + working with the odd placement. 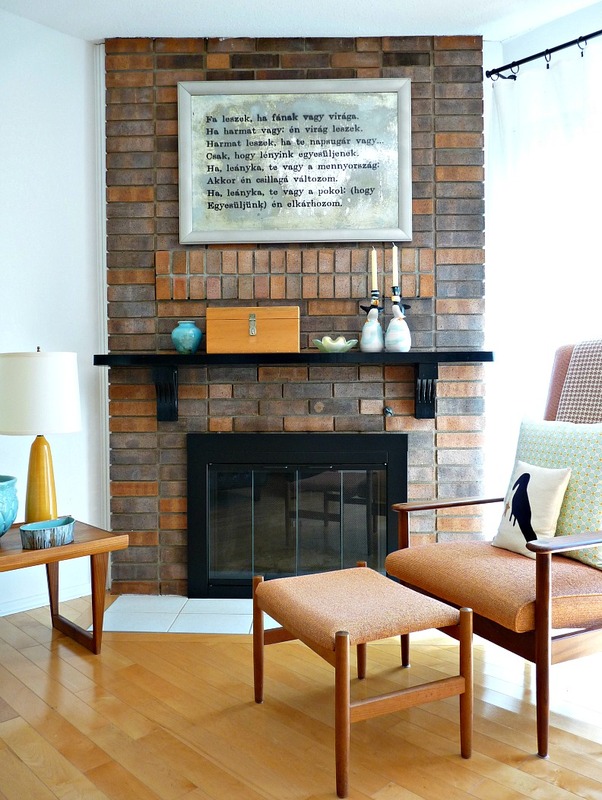 I really love how the mirror is scaled to the fireplace&mantle. 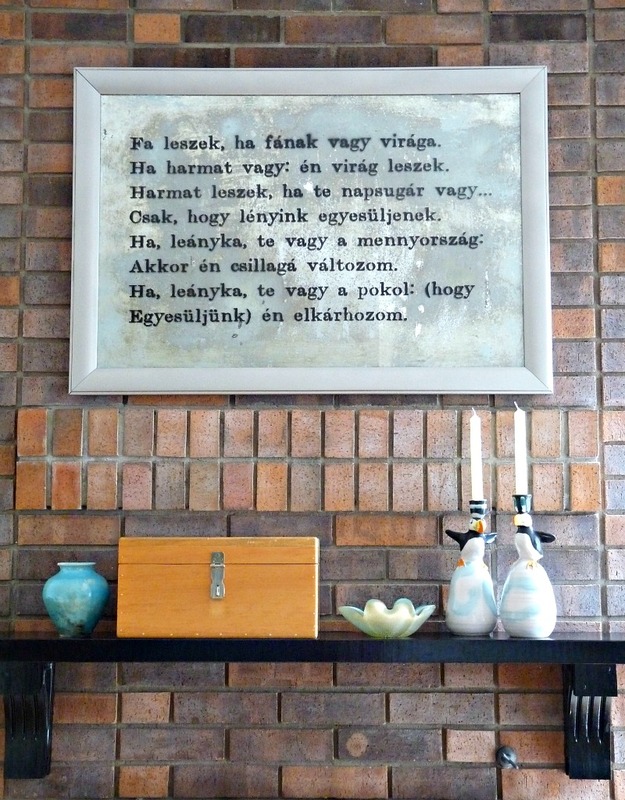 Everything from the antiquing of the mirror, to the lovely and touching poem to the frame is perfect. You have a great eye, and some serious talent Tanya! Thanks! I'm pretty excited about how it turned out! 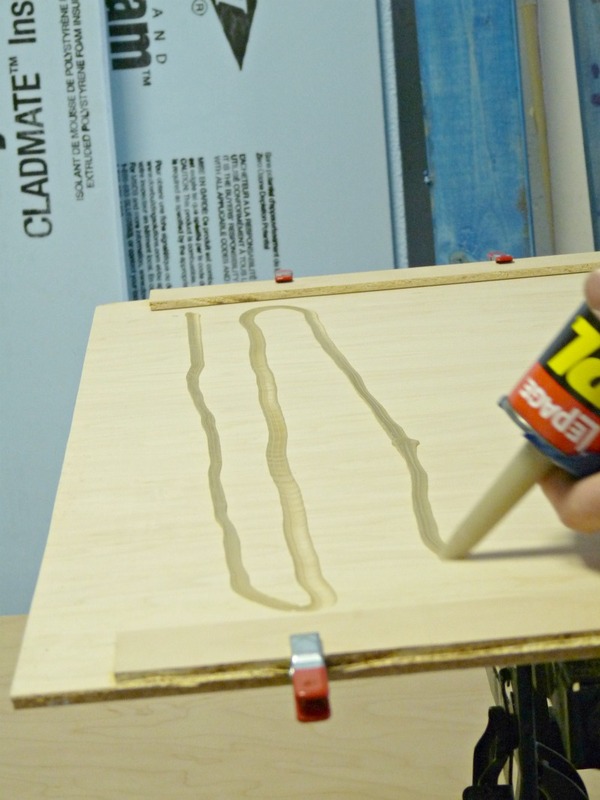 this is such a great DIY…..how long did the whole process take? Thanks! And good question! Antiquing the mirror took only about 15-25 minutes (plus "fussing" – getting the stuff ready, changing into work clothes, finding my painting glasses, etc).Stenciling the mirror took only about 15 minutes, including set-up.Cutting out the frame and putting it together took a couple of hours (including painting the trim pieces).And then it took about 15 minutes to get it hung.So, about 3 hours, plus shopping for supplies. 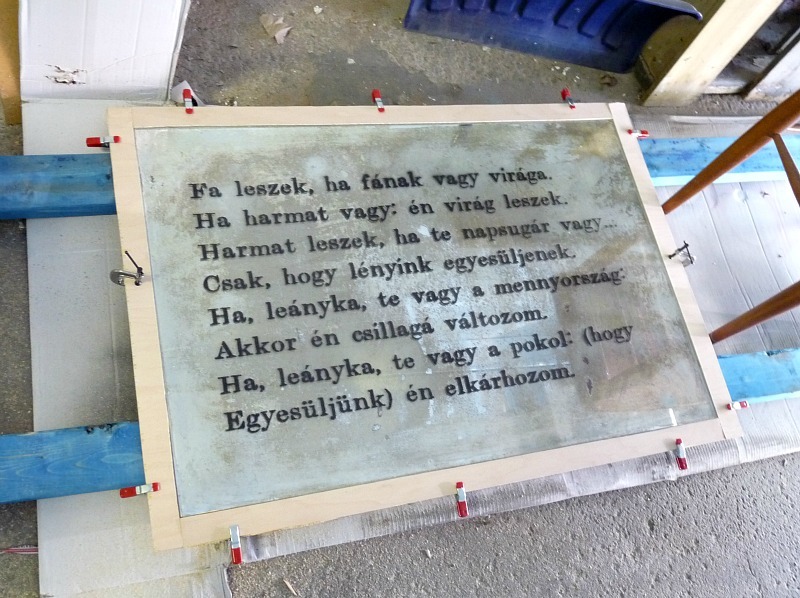 Perfect for the space…and the poem is wonderful! Thanks Dana! The poem is kind of haunting, isn't it? I'm such a weirdo, I'm not normally moved by poetry but this one is so beautiful. totally dying over this! love it! and yet again, your blog disappeared on me, and tonight, pop, lots of your posts showed up in google readyer. i don't get it1 but just know when it comes i am happy! Thanks! Hmmm, why does your google reader not like me??? Well, glad you found your way back anyway! This turned out awesome! I couldn't tell how large it was until I saw the pic of it above the fireplace. What a unique project. Thanks! 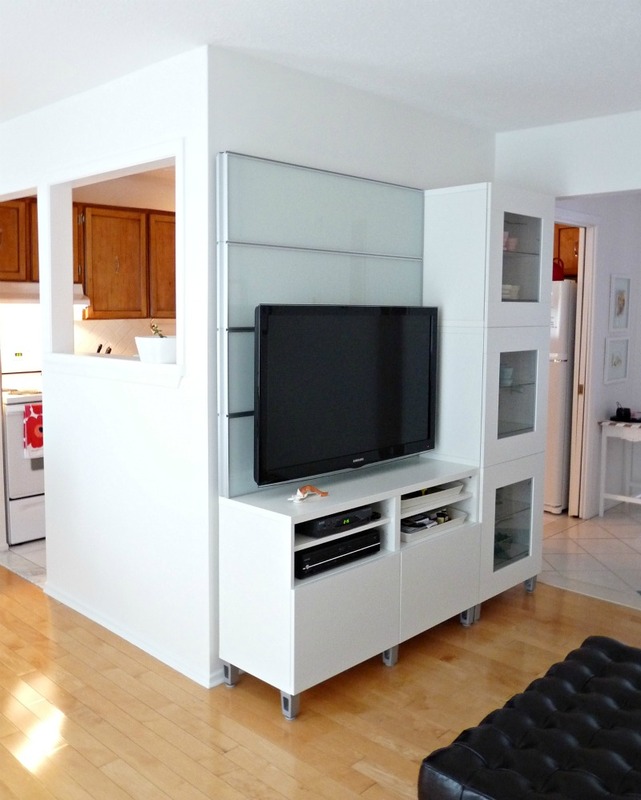 Yep, it's pretty sizable – I needed something of a larger scale in the space and this was an affordable solution because I already had the mirror and we made the frame! 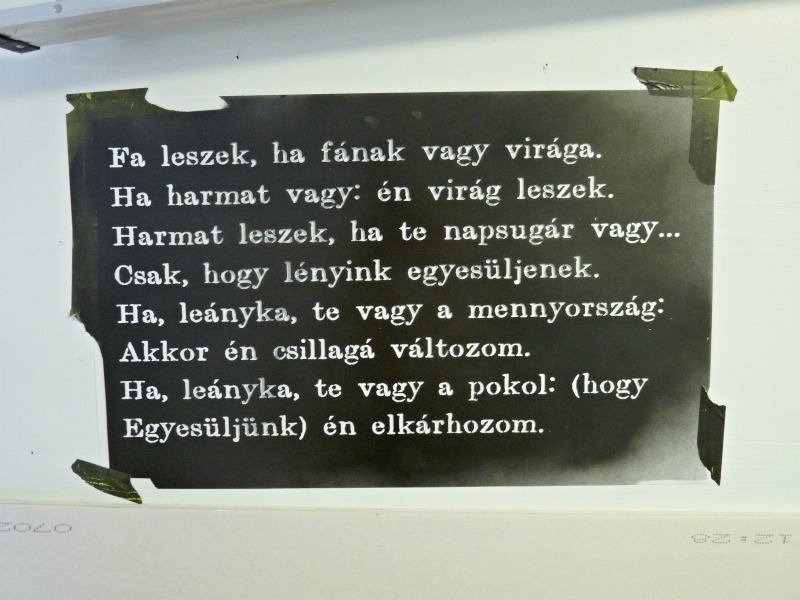 Gyönyörű a vers, csodálatos a tükör, szép enteriőr! Gratulálok a tökéletes kompozícióért! Köszönöm szépen! 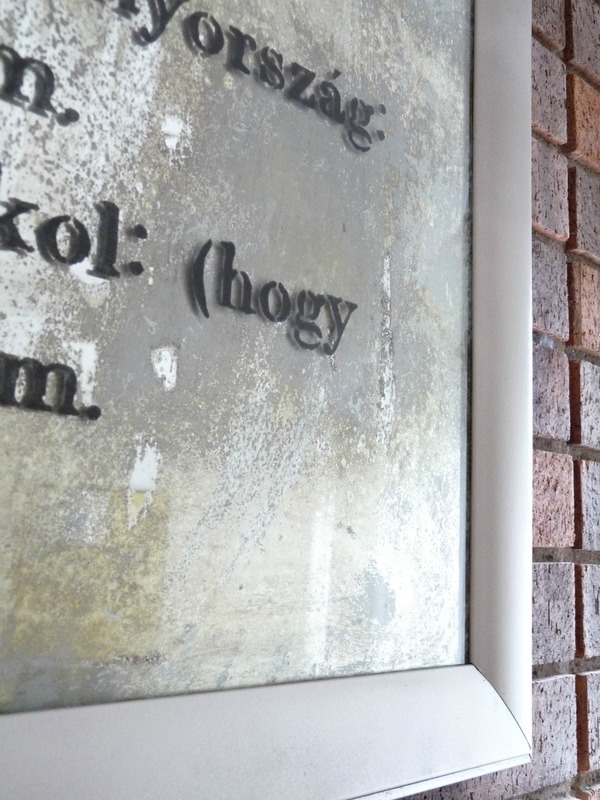 Aggódtam, hogy én rosszul másoltam a verset :)Örülök, hogy tetszik! Thanks!! 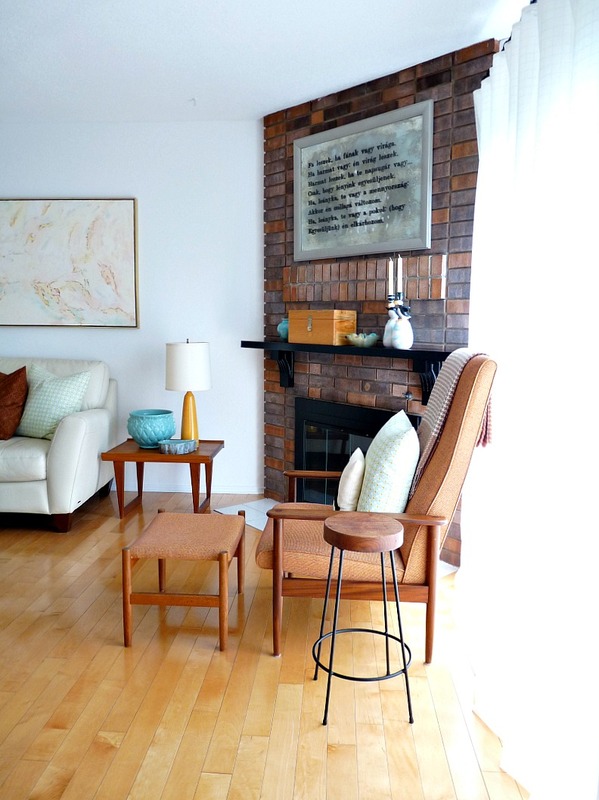 The chair and ottoman were a find from the classifieds. A woman had freshly reupholstered it, and then decided it wasn't a good fit. Her loss was my gain. 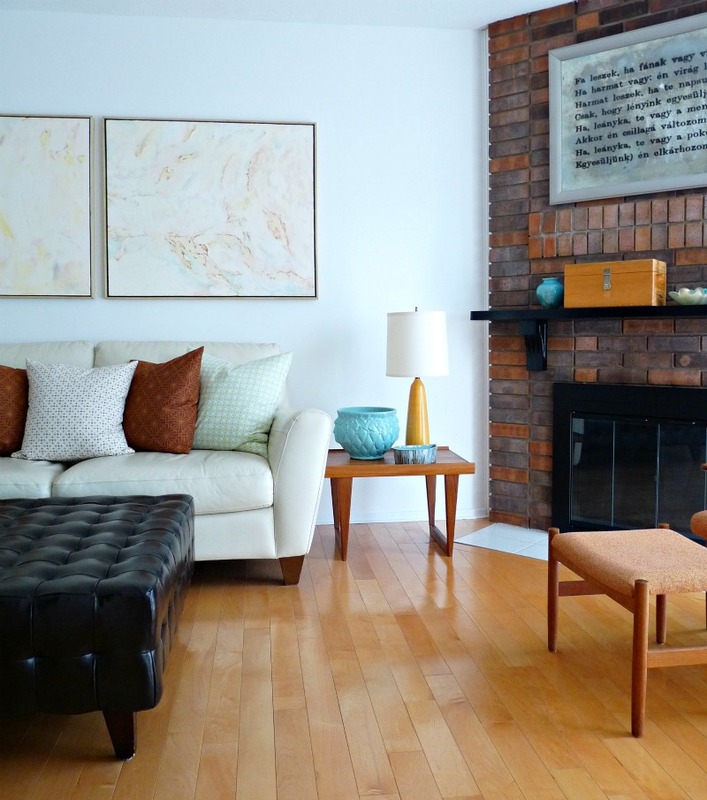 I was really lucky because the apricot hue of the upholstery was perfect for my space. Love everything about this. SO impressed with your framing skills too – that takes a lot of talent. I was in HomeGoods the other day and 90% of the artwork had words on it, and I thought to myself "I hate when there are words in artwork, it just looks so tacky…" But then I thought, "WAIT! T is the only exception!" LOL – but it's true, you put your own spin on these pieces and they look amazing – a million (trillion, billion) times better than anything I find in the home decor stores (especially in the artwork aisle where everything had obnoxiously colored birds with the words "Love" and "Chirp" on it. I'm still trying to figure out what love has to do with chirping…). 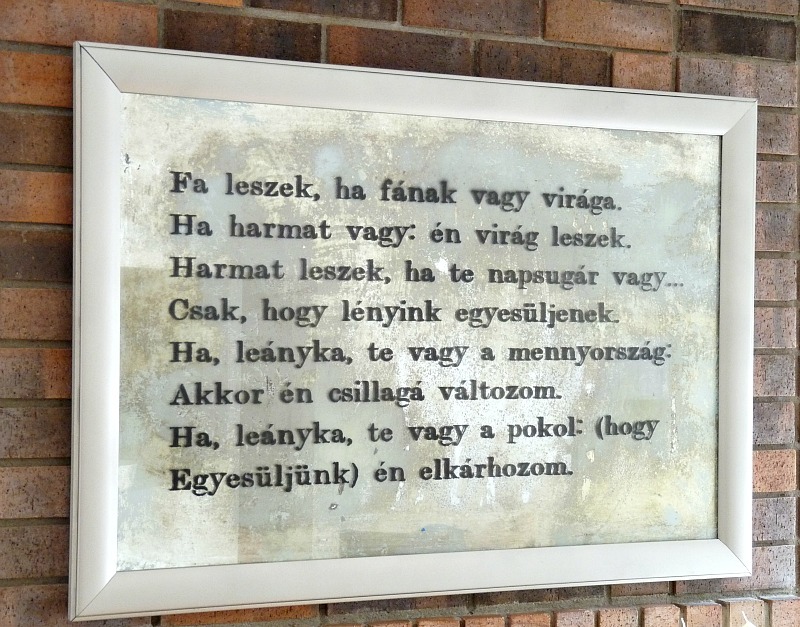 The Hungarian poem is amazing – I'm going to have to stash that one away. BTW – drooling over your yellow lamp in the den – looking for 2 of those for our bedroom redo! Thanks Erica!! 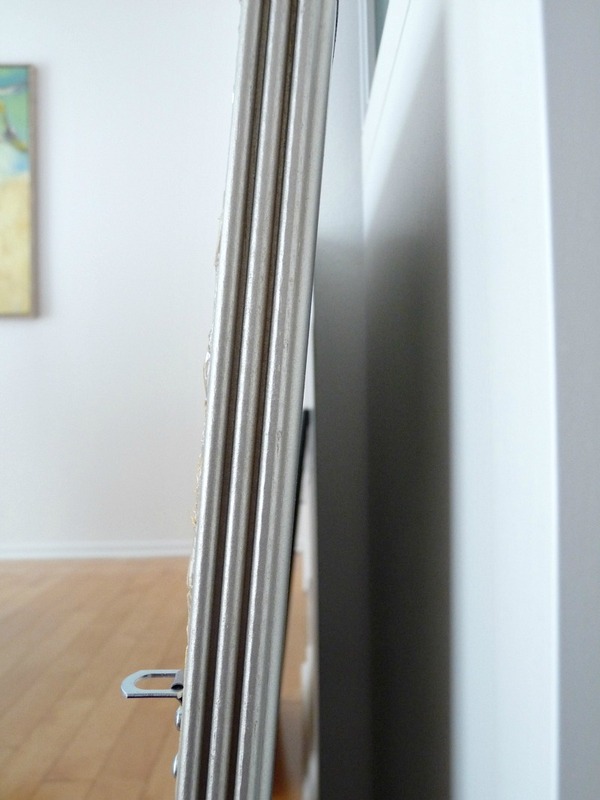 I like words on art – but only if it means something or is personal somehow. There's is an abundance of kinda random wordy stuff out there.The lamps are vintage Lotte lamps, but you can still buy them today. very creative and unique idea! Tanya – it's lovely! Beautiful job and awesome tutorial! I'm going to include a link back in the DIY highlights. Thank you so much for always sharing your amazing creativity! Either Hungarian or English 🙂 But I write horribly in Hungarian, so you will have to suffer my poorly written replies (I read & understand much better! )Annyira boldog vagyok hogy tetszik az projektem. A tiéd is fantasztikus! Különösen a Gotye kacsa! I absolutely love your style. The patterns and colour-pairings are just so perfect and what I'd dream for in a home. Good eye girl! I am absolutely in love with your blog! 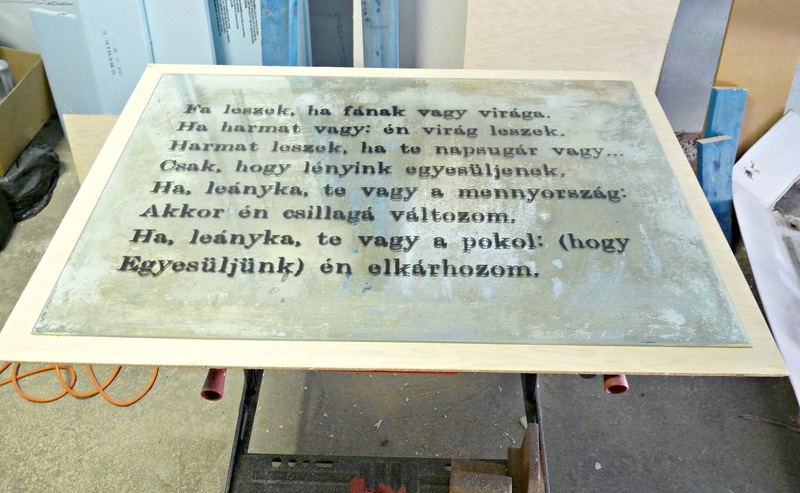 This project gave me some BD ideas for my husband, as he loves Petőfi. 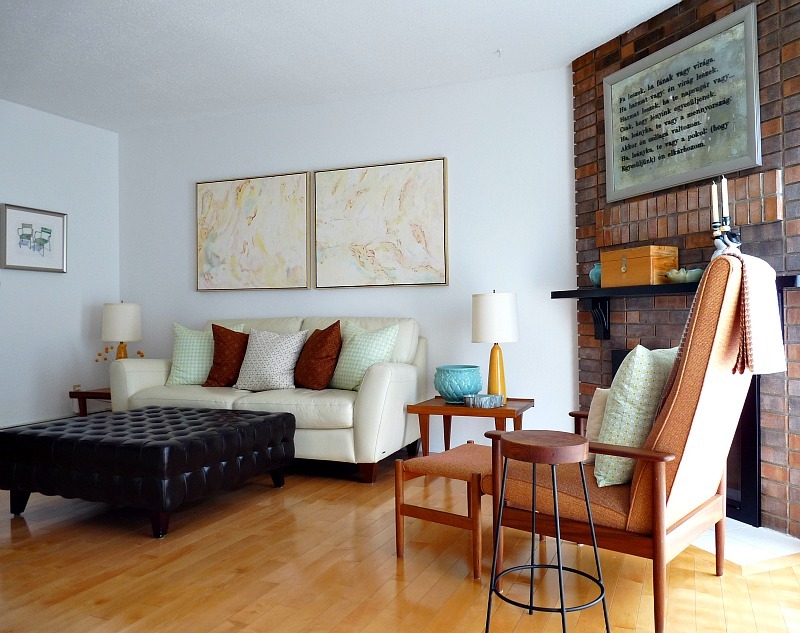 Recently we bought our first home in NW Onatrio (hmm, I think we could be considered neighbours) and I was looking for reno ideas when I stumbled on your blog. What a lucky find. Szerelem első látásra!